Let's rule that out. Run FEBE Options > Advanced > Clear FEBE preferences. You will need to re-enter all options after. Well, the next step is to see if you have any extensions that are conflicting with FEBE. I have an addon for that named FECT. It will disable your extensions one half at a time to help you discover the conflicting extension. You will need to attempt a backup after each iteration until you find the conflict. Depending on how many extensions you have installed, it shouldn't take more than 5 to 8 iterations. cbaker_admin wrote: Well, the next step is to see if you have any extensions that are conflicting with FEBE. I have an addon for that named FECT. It will disable your extensions one half at a time to help you discover the conflicting extension. from having to troubleshoot FECT also mainly cause i didn't understand fast enough as i desire to..how i should click to operate it, so i instead manually disabled my 6 add-ons excluded Session manager 0.8.1.12 that i didn't dare to disable. Still that didn't fix the problem, but i believe it was enough for us to be able to move on from suspecting an add-on for this. What would be the next troubleshooting step from that?. Well, that has to be the cause of the script timeout problem. Each open tab in Fx runs in its own process. If you have 1000+ tabs open, you've got 1000+ processes running at the same time. That's going to slow down Fx dramatically. You said you have FEBE Options > Advanced > Advanced preferences > Chrome script timeout (seconds) set to zero? That used to mean 'don't check for timeouts', but that may have changed. Try setting it to a high value - perhaps 180 seconds (that's three minutes). The next debug step I was going to recommend was trying FEBE with a new, fresh, profile with only FEBE installed. But you mentioned that there are no problems with your two other profiles so that test is unnecessary. I dot have 1000 pages open now, but my profile folder size...seem to have become 12.8 gb large, is that to much? so that it blocks the profile from doing a backup when i only have the start page open?, cause i tested that..and i still got the the script error. A profile transplantation without having to diet it? To create a new profile then copy over my sessions-files into the new sessions folder?, would that bee any idea worth testing? 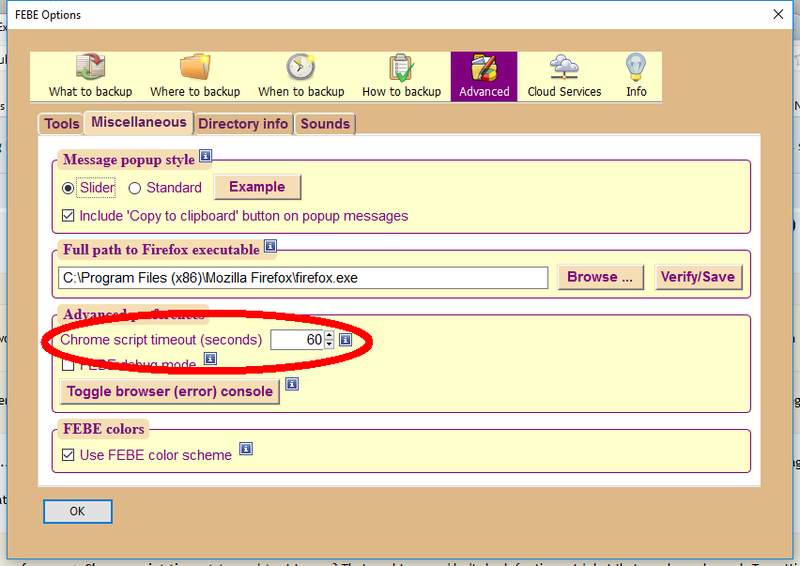 cbaker_admin wrote: You said you have FEBE Options > Advanced > Advanced preferences > Chrome script timeout (seconds) set to zero? That used to mean 'don't check for timeouts', but that may have changed. Try setting it to a high value - perhaps 180 seconds (that's three minutes). Just to double check, I don't see where you are now! . I can only get to that advanced settings inside about:config, but perhaps it doesn't matter from where?. I changed to 180 and restarted Firefox, it didn't help. My biggest profile is about 110 MB (and tht's with 44 extensions installed). If yours is 12.8 GB, it is extremely large. Perhaps you should consider either cleaning up your current profile, or creating a new one and adding only what you need. The first thing I would do is clear out old history items and your cache and cookies. When done, you can clean up your places.sqlite file with the Vacuum Places Improved extension. Okay,thanks for that screenshot, found it. However the issue is the profile size off course. why session manager in the first place wanna delete any sessions! and then dump it there...where i have ordered it to stay for 27 days before deleting. Maybe cause I don't wanna delete this sessions since i can never verify who they are or who they where in the past! before it got dumped here?. I just use Fx's built-in session manager, not an extension. I would think you could remove that "delete" folder to reclaim profile space, but to be sure you should ask in the Session Manager forum.